I was thrilled when Grow and Behold started to sell kosher, organic, pastured lamb as well as beef and poultry. This was the centerpiece of a Rosh Hashana feast. Tell G & B that Elise sent you. The most important part of this recipe is to cook the lamb S-L-O-W-L-Y. Make a charcoal fire, or heat a gas grill. If using charcoal, let the coals burn down until they are ashy and push them to one side of the grill. Spread the meaty sides of the racks with the mustard and then press the parsley, rosemary and thyme onto the meat. Sear the racks of lamb over high heat, or directly over the coals, meaty side down, until they are nicely browned, about 6 minutes. Turn the racks so that they are leaning against each other with the bones pointing up and grill until the meaty sides are nicely browned on the bottom, about 3 minutes. 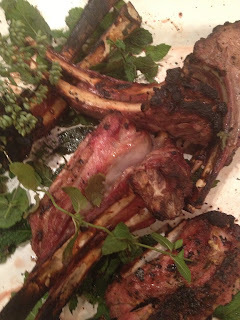 Turn the racks bone side down and lower the heat to moderately low, or move the racks to the cooler side of the grill. Cover the grill and continue cooking until an instant-read thermometer inserted in the center of the meat registers 130° for medium-rare meat, about 20 minutes. Transfer the racks of lamb to a carving board and let rest for 10 minutes.